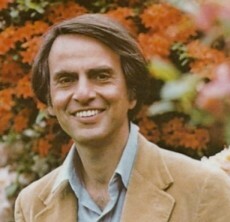 I wrote about Carl Sagan‘s Cosmos in a recent post on the One Book Meme. Tonight, twice during the documentary An Inconvenient Truth, Al Gore mentioned some Sagan quotes that I remembered from past reading. The first one was about the thickness – and hence the fragility – of the Earth’s atmosphere. He was saying that if you had a large model globe of the Earth and put a layer of varnish on it, the thickness of the varnish in comparison with the size of the globe would give a reasonably good idea of the thickness of the atmosphere in relation to the size of the real Earth. The second quote, which I shall never forget, pertains to a picture taken by Voyager I as it left the solar neighborhood for the depths of outer space. An Inconvenient Truth was inconvenient for me, even though I belong to the camp that accepts global warming as fact, and climate change as euphemism. The graphs correlating the increase in the atmospheric carbon dioxide level to the rise in temperature are alarming – but not as alarming as the leaked government memo which instructed someone to “Reposition global warming as theory rather than fact.” It is astonishing that some people are so cavalier about bargaining a planet for an unsustainable economy. Do watch it. Apart from a few moments in which Al Gore reminisces on his personal life which could be construed as manipulative, it is a hard-hitting and well-made film. This is absolutely wonderful stuff. It moved me immeasurably to read what Sagan has to say about our being on a speck of star. This idea that we’re alone in a vast universe is not at all a revelation, but in the hands of someone who’s a scientist and a fine writer like Sagan, it registers with astonishing force. Do you know the bit in To The Lighthouse, where the father chants the lines from Cowper, “we perish’d, each alone,” as he rows to the lighthouse, lines the mother says later as she sits by the window. One of the consolations of being alone is literature I suppose, and knowing that, in fact, we aren’t the only ones who’ve noticed our essential solitude. Yes indeed, Sagan’s point registers with great force. and it doesn’t hurt that his language is so beautiful. Owing to the as-yet inconclusive search for extra-terrestrial life, Sagan has repeatedly described humanity as “tiny and insignificant” on the one hand and “rare and precious” on the other. Ellie Arroway’s speech at the end of the movie Contact also contains those words. Alas, their appeal is not universal. I watched it with a friend who came away thoroughly unimpressed by the film’s romance with science. I’m afraid I haven’t delved into Virginia Woolf; the closest I came was reading Michael Cunningham’s The Hours, a biography by Nigel Nicolson, and some letters. To The Lighthouse goes to the TBR list for sure. After seeing the Inconvenient Truth movie, I just want to know, how big does this globe need to be before the coat of varnish is “to scale”? When does the varnish match the thickness of our atmosphere? Does the globe need to be really small? The diameter of the earth is around 12600 km disregarding the fact that the earth is a slightly flattened sphere. The thickness of the atmosphere is a contentious issue with answers ranging from 400 km to 1000 km. However, about 75% of the total mass of the atmosphere, including most of the moisture and breathable air resides in the troposphere, which is only about 10 km thick. (12600/10) x 0.25 = 315 mm. This is the sort of model globe that we typically see in small classrooms. I hope this was what you were asking about. I remember reading the statement about the atmosphere and a coat of varnish in one of Sagan’s books before, and Gore’s mention of it brought it back to my attention. Thanks for the info. Carl Sagan is a hero of mine, as is Al Gore nowadays. Use the scale bar to measure the varnish – it is 0.0075mm! Nothing beats seeing it with your own eyes. Let’s just call a spade a spade. The claim is garbage math. Makes you wonder what other liberties were taken in An Inconvenient Truth. My estimate of the varnish thickness was also obtained via google search, Josh. Clearly, the measurement you cite pertains to a precision varnish, not something you would find in a garden-variety shop. Still, neither Gore nor Sagan claimed the this statement was scientifically accurate. It is merely a ballpark calculation aimed at pointing out the fragility of the atmosphere. From the tone of your post, I sense a political opposition to Gore’s stance, which is entirely ok. But it beats me why you would equate the veracity of a rough analogy with that of mountains of experimentally obtained data. I guess it depends on his mood. I’m not a political hack, but I would like to encourage people to think for themselves and check facts (especially when they’re reported by the media or even worse, politicians). Polaris, you did the math, and I honestly don’t know how you found a varnish thickness that large (0.25mm), but at least you tried to do the math. We need more of that. Josh is on the right track though. Besides, the thickness of the atmosphere compared to the size of the Earth is a moot point as it doesn’t say anything about anything. You would appear more credible here on this issue if you could get your facts straight. This was not a memo out of ‘the government’, it came from a coal industry PR campaign – but here’s a little homework assignment for you: for such a damaging memo that’s supposedly the “smoking gun” against scientists who disagree with the idea of man-caused global warming……….. why is it not seen in its full context anywhere on the internet, or in a single one of the dozens+ books mentioning it? If it turns out no one was under corrupted direction to go out and ‘reposition global warming as theory rather than fact’, what happens to that entire side of your argument? Roald A, thanks for setting the record straight about the memo coming from a coal industry PR campaign, not from the Bush government. I stand corrected. As to why the memo is not seen in its full context, I have no clue. The I.C.E (Informational Council on the Environment), which produced the memo and initiated the campaign was exposed by a number of newspapers, and later discontinued. That much is known. As to what it does to my argument that someone was under corrupted direction to obfuscate the truth about global warming, well, it weakens my argument considerably. As to what it does to the (more important) evidence-supported argument that anthropogenic global warming is, in fact, happening: Nothing. Climate data hasn’t much to do with agendas for or against advancing the theory of global warming. The ICE memo with the “reposition” phrase is the central accusation that supposedly proves scientists skeptical of man-caused are corrupt, you can certainly find that accusation on your own. But when that particular memo can’t be found, does that not indicate a sizable problem with the accusation itself, and those who promulgate it? If nothing has corrupted the skeptic scientists, then you, Al Gore, the mainstream media, and others would be obligated to find out if those scientists’ assessments that contradict the IPCC are valid, correct? The argument is not whether global warming is happening, it is whether human activity is a major factor causing it, as was drastically implied by the Gore movie. If there is no actual consensus of scientific opinion exists (despite Gore’s citation of Naomi Oreskes, her methodology was wiped out, if you care to look for it), and skeptic scientists provide literally thousands of peer-reviewed science journal-published papers – as seen in the NIPCC 2009 report ( http://www.nipccreport.org/reports/2009/2009report.html ), then what happens to your argument, assuming you agree humans are responsible for global warming? Sorry, I don’t get it. Are you suggesting that the memo never existed? If so, I would be totally at fault for promulgating the accusation. Yes, that was what I meant. I edited my comment to specify “anthropogenic”, but you might already have started drafting your reply by then. I’d be interested in finding out what the papers say, thanks for the link. I’ll read some of the papers when time allows. I cannot fail to notice Fred Singer’s name there – this is one of the guys implicated in the “theory not fact” accusation above. So, along with reading the report, I’ll also like to check out the political motivations of NIPCC (if any). Just saying that they are independent is not enough. Ironically, Singer is one of the people instrumental in the formation of the NIPCC. So, I hope you grant that I can be as skeptical of Singer as you are of Gore. Perhaps, a reading of these papers will sort things out. Lastly, please refrain from blanket assertions such as “you, Gore, the mainstream media”. You have no idea about what I think of Gore based on one blog post. I happen to be a researcher and am interested in finding out the truth – and if proper science really shows that anthropogenic GW is a lot of hot air – I will readily change my stance on it. I’m not interested in taking sides just because that is cool. You will notice that I refrained from stereotyping you, and I expect the same from you. If you agree to keep your “here is a little homework assignment for you” and “you would appear more credible here” -style of patronizing to yourself, we can have a nice discussion. Otherwise, I’m not interested. This blog appreciates discussion; it is not a place for people to vent. When anyone makes errors based on assumptions and a lack of research, it undermines their credibility. Cross examining lawyers in court cases are quick to point this out to juries. I did not mean to be patronizing with my statement about credibility, certainly my own credibility would be in question if I made errors. Nor do I mean to be patronizing when I suggest ‘homework’ or ‘research’ or however you wish to characterize it – the question remains, why is the memo not seen in its full context? I’m not suggesting anything about its actual existence, but rather if you or others have any concern about repetitions of it in the absence of anyone being able to confirm for themselves what the memo actually says. Also, no “blanket assertion” is intended of your general opinion of Gore. I simply ask if you and the others are obligated to consider the validity of skeptic scientists’ assessments, if it turns out the scientists are aren’t corrupted by industry money or political persuasion, or in Singer’s case, “implicated” in the ‘reposition accusation’. Your opinion of Gore in general is irrelevant, if there is no reason to discount skeptic scientists’ assessments / science conclusions, correct? Returning back here after a long long time …. If you are not being patronizing, then I don’t know what you are doing. You say you like to ask questions rather than make assertions, yet you don’t catch yourself making several in that post. I repeat. Be civil to me, and I shall be civil to you. If you start by “You would appear more credible if…”, you are being snarky. And I have no time to deal with people who have a superiority complex just based on what they have read somewhere. I could choose to delete your comments because I don’t care for your attitude, but refrain from doing so because there was some useful content in it. Now, to the heart of the matter: I read a couple of papers expressing doubts about GW. Quite fascinating. I am now less sure about whether global warming is anthropogenic or not. This is based solely on the content of the research, not on propaganda by Singer et al.. Given a choice about whether to act conservatively with regard to the planet or its resources or to act recklessly, I would still want to act conservatively. For me, Pascal’s wager applies here, more or less. You are free to respond as long as you address the issue respectfully.